Many fabricators in the Epoxy Countertop Manufacturing Business are looking for an alternative to using epoxy as a medium. The reason for this is due to the request for exterior applications. When using Epoxy as the bases for terrazzo Epoxy countertop fabrication you encounter unwanted attributes like; yellowing, fading and curling due to UV. The pitfalls just mentioned are typical problems inherent to the Epoxy countertops. After hearing the negative, why would someone use Epoxy as a medium? 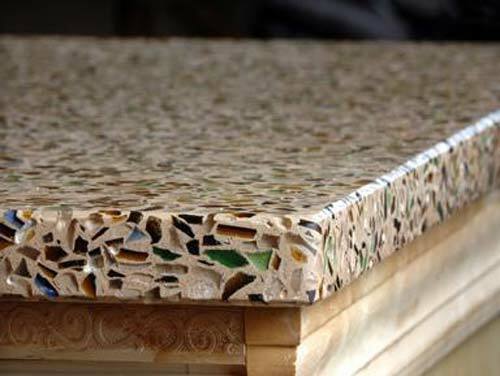 For interior application Epoxy Countertops are able to take advantage of recycled aggregates such as glass or granite. This makes for a beautiful and individualized end result. Until now, Epoxy was the only medium in which you could create that look on a manufacturing level. Through years of research and testing, SureCrete Design has created a solution for Epoxy Countertop Fabricators. Using the Xtreme Terrazzo Counter top Mix provides a medium in which they can continue to use their recycled aggregates while enjoying adding benefits as; the same look at a lower material cost, can be used outdoors for outdoor kitchens and concrete countertops, larger array of design options, and the ability to work or tool your slab 4 times faster than epoxy! In addition to those benefits, Xtreme Terrazzo can be used with your current precast forms, polishing equipment and cutting techniques. What is Xtreme Terrazzo? It is a pre-blended bag mix that utilizes the latest in cementitious and fiber technology. Xtreme Terrazzo delivers over 10,000 PSI compressive strength and a flexural strength of 1,457 PSI. It also aids the fabricator in achieving a “Green” concrete countertop option. Each kit of Xtreme Terrazzo comes as a 60 lb bag and 2 gallons of modifier. The concrete countertop fabricator can than add up to 80lb’s of local aggregate, recycled glass or recycled natural stone such as granite. This mix design does not have any polymers in it so it has zero VOC’s.